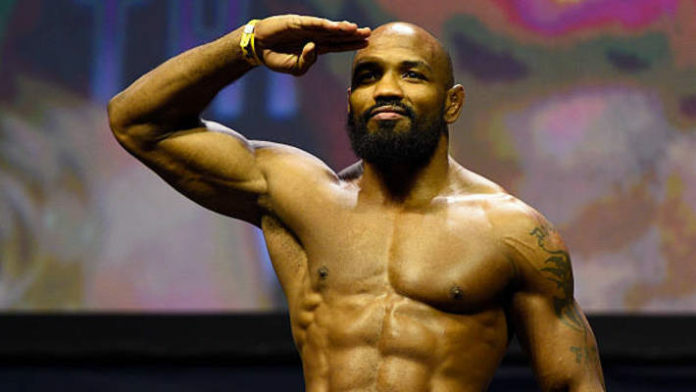 ESPN reported Wednesday afternoon that the UFC was planning to have Yoel Romero vs. Paulo Costa headline the first event of the year, UFC Fight Night 143, however injury to Costa have foiled those plans. The Romero camp has now come forward with a solution and a name: the consensus greatest middleweight of all time, Anderson “The Spider” Silva. According to the report, Paulo Costa will be ready to fight in March and was requesting for Yoel Romero to return the favor of waiting until he was medically cleared. But at 41 years of age, the “Soldier of God” is having none of it and is seeking to remain on the card in what will be a showcase between two men who arguably boasts the most impressive victims list in the history of the middleweight division. Anderson Silva is currently without an opponent and is now free to return to action after settling with USADA following a tainted supplement determination. Aside from Dan Kelly who only ages Romero by a few months, Anderson Silva is the only middleweight to be Romero’s elder. This could be viewed as a legacy fight that both parties have expressed interest in. At the present, it is Yoel Romero who is pushing for the bout, but Silva also once expressed an interest in facing Romero in 2017 after Silva’s UFC 212 bout with Kelvin Gastelum was cancelled. In fact, Silva stated that if he did not face Romero for the interim middleweight title at the event, he would retire. Do you believe Yoel Romero vs. Anderson Silva is the fight to make?